This feature was first published in my Pinnacle Newsletter (4th of August 2018). Most of my newsletter work never gets published elsewhere, but I felt this article was more significant than most. To sign up to receive my weekly letters on the outdoors, writing, and outdoor writing, click here. GPS versus map and compass is a perennial debate amongst outdoor enthusiasts. 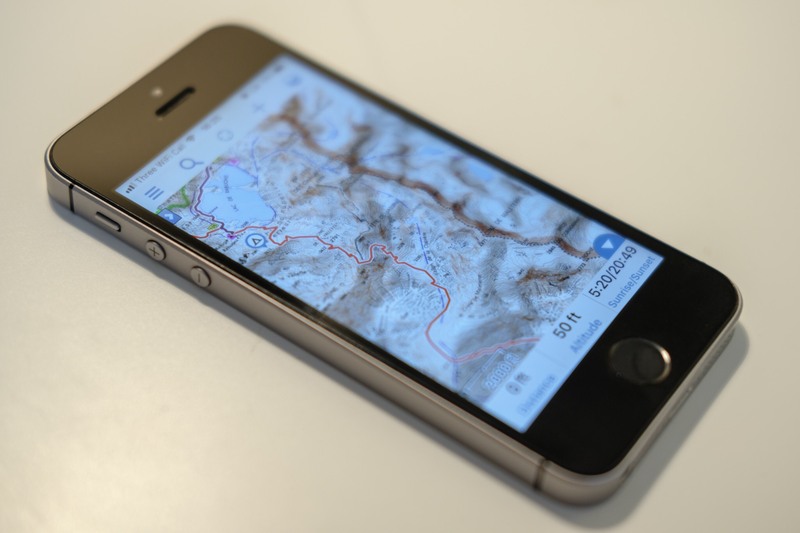 Tossing the phrase ‘A smartphone is suitable as a primary means of mountain navigation!’ into a room full of bearded mountaineers can have a similar effect to a hand grenade. This week, I read a very interesting blog post called Adventure and Tech, published by Mark Rickaby at The Peaklander. Here are a few of my own thoughts prompted by his article. Online, the conversation about hillwalking often begins with a safety disclaimer along the lines of ‘Always bring a map and compass with you, and know how to use them.’ This remains useful advice, but the picture is far more complicated than it was 15 years ago, because map and compass is no longer the only safe way of navigating in the mountains. In some circles it’s heresy to admit this, but here we go: I almost never use paper map and compass. The last time I used a paper map as my primary nav tool was 2015. Since then, paper map and compass have served as vestigial backups, carried in the event of tech failure but never used in anger. Knowing how to read a map and find your way in the landscape are the important things – and that will never change. The methods used to put that map in front of your eyeballs and orient yourself are significantly less important. I am absolutely confident navigating with a smartphone (equipped with the proper software and accessories) in the most intricate mountain landscapes, and appreciate the huge time savings – not to mention the reduced cognitive load when I’m faced with potentially consequential nav decisions. I have covered thousands of miles like this with no issues. Would I leave my map and compass at home? No, because as a backup system it’s simple, reliable and lightweight, and the consequences of being unable to navigate would be severe in the event of equipment failure. Of course, personal preference plays a huge role here, and I respect the fact that some people like to leave technology behind when they head into the hills. But when these opinions become galvanised into dogmatic viewpoints, we’ve got a problem. Traditional navigation is a useful and satisfying life skill that takes time and practice to learn. It’s a skill that most members of the general public don’t have. This can make us feel a bit special – like members of an exclusive club – but it’s important not to let this go to our heads. We shouldn’t be using our status to exclude those who don’t have this knowledge or make them feel unwelcome – and, even if not intentionally elitist, language such as ‘proper mountain folk’ and ‘Ben Nevis was overrun with tourists at the weekend’ perpetuates this culture. I feel that a minority of outdoor enthusiasts have put traditional navigation skills on such a pedestal that no alternative will ever be able to compete – far beyond the facts of the comparison. This will only make the barrier to entry all the higher for newcomers to hillwalking and mountaineering. Worse, the more bullish voices often have little experience of the tech they are denouncing. If you prefer to navigate by map and compass and dislike using a smartphone in the mountains, that’s absolutely fine. But let’s not cloud mountain safety advice with outdated elitism. We should be encouraging newcomers and helping them to develop the necessary skills in a way that suits them, not smugly telling them they’re doing it wrong.